Ripe with history and bursting with spiritual significance, Israel is the birthplace of two major world religions, Christianity and Judaism, and home to important religious sites for another, Islam. Before my recent visit, I had my own ideas about what this country would be like. While there, I was shocked to learn the following fascinating facts from my group’s knowledgeable tour guide, Marion, a religious history expert and Belgian expat living in Israel. 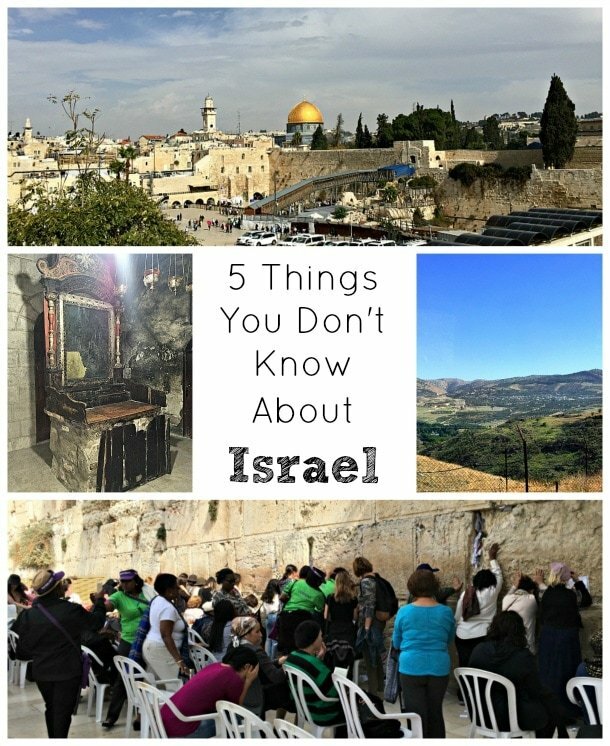 Here are five things you probably don’t know about Israel, even if you have visited the country. In developing this story I also did research online to confirm and add to the information, I learned while in Israel. I have linked to relevant sources within the text. 1. The Western Wall is considered holy because it is closest to the rock where Abraham was told by God to sacrifice his son. 2. 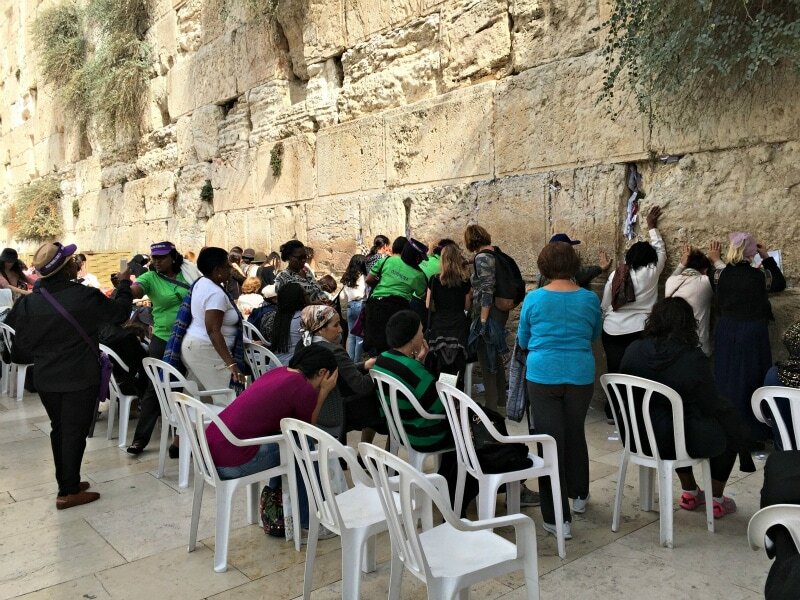 Israelis would prefer you call it the Western Wall, not the Wailing Wall. 3. Disputes in Jerusalem last year were about Temple Mount, not land. 4. The Tomb of Jesus at the Church of the Holy Sepulchre does not contain the bones of Jesus. 5. Not all of the West Bank is dangerous. According to the Old Testament story, Abraham was called on by God to sacrifice his son, Isaac (Ishmael, according to Islam), as proof of his faith on a hill that is now called Temple Mount. As Abraham prepared to kill his son, God told Abraham not to perform the sacrifice, thus calling an end to human sacrifices, which was the tradition of some pagan religions at the time. Today Dome of the Rock, a Muslim shrine, stands on the rock where the sacrifice would have occurred. Muslims believe the rock is the place from which the Prophet Muhammad ascended to heaven. It once was the location of the first Jewish temple, Solomon’s Temple. Later the temple was turned into a Christian church by the crusaders. The Western Wall and Dome of the Rock are both part of Temple Mount (or Mount Zion). All three faiths, Judaism, Christianity and Islam, consider Temple Mount an important holy place. Jerusalem is a walled city and the Western Wall is closest to Abraham’s Rock of Sacrifice. The Western Wall was so named by Christians who made religious pilgrimages to Israel in the 19th century. Upon observing Jewish people at the wall davening, or rocking back and forth while praying, the visitors thought the Jews were mourning, or wailing. Hence the name was born. Another explanation maintains that the term Wailing Wall was created when Jewish people would visit the wall every Friday to mourn the loss of Jerusalem to the Turks in the 1800s. With the reunification of Jerusalem after the Six-Day War with Jordan in 1967, the site transformed from a place of wailing to a place of celebration. In fact, when you visit the Western Wall you will likely see joyous and boisterous celebratory processionals of weddings or bar mitvahs (a Jewish coming of age ceremony that takes place when a boy turns 13). You might assume that last year’s of stabbings in Jerusalem were due to land disputes in the West Bank and the Gaza Strip. In reality, the violence was being perpetrated in protest of some devout Jews who had been praying on the steps of the Dome of the Rock, and because wooden benches were placed near the Western Wall for elderly visitors. Some Palestinians saw these acts as an attempt to take over Temple Mount. Based on the news I’d seen on television, I was expecting to see Israeli military with machine guns at the ready wherever I went. Instead, I was shocked by the lack of military presence in most places. I felt safe wandering the streets of Jerusalem and beyond, and was welcomed by both Jewish and Muslim citizens. The Church of the Holy Sepulchre is renowned as the location of the crucifixion and the tomb of Jesus of Nazareth. This is the most significant Christian site in all of Jerusalem and thousands of pilgrims visit the church in Jerusalem every year to pay homage to their savior. The church is shared by three sects of Christianity: Greek Orthodox, Roman Catholic, Armenian Orthodox. Each of the faiths has its own chapels with its own symbols, traditions, artwork and ceremonies. Some areas of the church are also used by Coptic, Syriac and Ethiopian Christians. 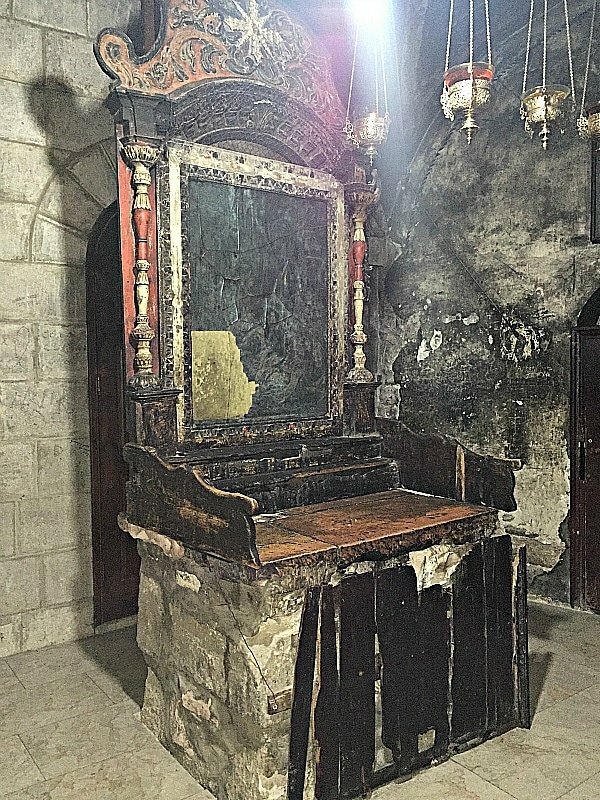 Inside the church is a stone monument, held together by a steel frame, that encloses the tomb (sepulchre) where many believe Jesus Christ lay buried while his followers observed the Sabbath — and where he rose from the dead three days later. The Tomb of Christ, however, does not contain the bones of Jesus. More likely, they are buried beneath the church in the crypt. While everyone else lines up to view the Tomb, you can visit the unmarked, unassuming fire-damaged chapel to peek down the stairs that lead to the crypt where Jesus is buried. Our guide said that although she is unsure of the historical accuracy of many of the religious sites in Israel, she is 99% sure that Jesus’ remains are indeed contained within the Church of the Holy Sepulchre’s crypt. The West Bank is divided into three Areas: A, B, and C. Palestinians control Areas A and B, and Israel has control over Area C, where most of the violence and disputes over land ownership occur. This division of the West Bank began with the Oslo Accord in 1993, when Palestinian and Isreali leaders attempted to end their 100-year conflict. 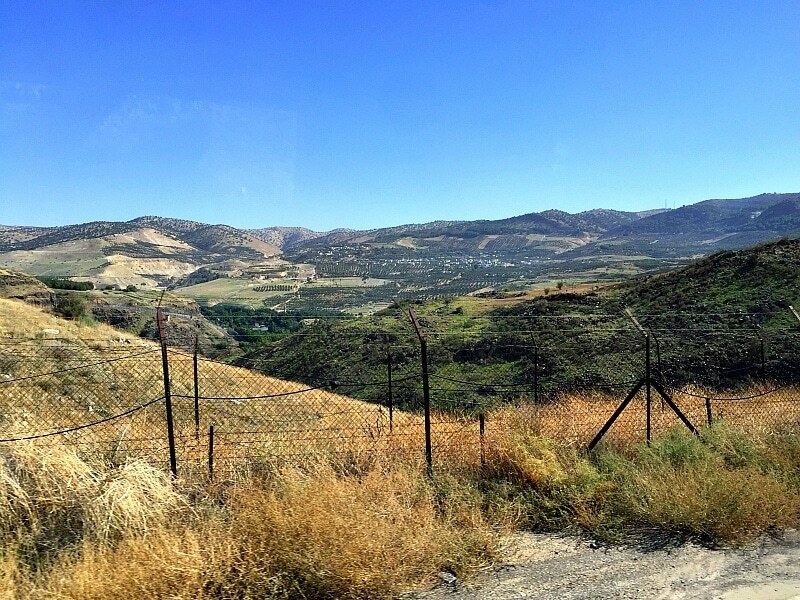 As we drove through the West Bank in a tour bus painted with something like Religious and Historical Tours of Israel on its side, my normally chatty fellow American journalists and I fell silent. Arabic bedouins who live a nomadic life of herding sheep in the territory are not used to seeing a lot of traffic. A young shepherd came running up from the dunes with an infectious grin, waving his arms to greet us. His joy lifted my worries away. I waved back and smiled. Things aren’t always as they seem on TV. How many of these facts did you know about Israel before reading this story? Let us know in the comments below! Great post! I had no idea about most of this, and what you say at the end is the key: you have to go places to see the real deal…unlike on TV. (1) Regarding “ending the tradition of animal sacrifices in the faith” : Perhaps you are referring to Islam, I cannot speak to that. Historically, Jewish animal sacrifices continued from the time of Abraham, around 2000 BC until the destruction of the Jewish Temple in AD 70. (2) Regarding the bones of Jesus (“More likely, they are buried beneath the church in the crypt”): Since Christians believe Jesus rose bodily from the dead and then ascended into heaven 40 days later, those who believe the historical record of the Bible would say that Jesus bones will never be found. The absence of Jesus’ bones is the critical historical assumption of Christianity. Although he is most well-known for his children’s books, Oxford-educated scholar C.S. Lewis (an agnostic turned Christian) asserts the historic understanding of the bodily resurrection of Jesus in his book, Mere Christianity. Hi Brett – Thank you for the input! The story of Abraham led to the discontinuation of animal sacrifices in the Jewish faith, but apparently this did not happen until much later. I will update the text to reflect this. I am speaking of Jesus’ bones in a historical sense, not from a Christian perspective. I thought about the Christian belief that Jesus rose from the dead when writing this story but decided to go with the historical route, just as evolution is taught in public schools rather than the story of Genesis. Also, SOME Christians believe that Jesus’ soul ascended to heaven, not his physical body. Have a wonderful time in Israel! Abraham’s life predates Israel by five centuries. This statement that his story led to the discontinuation of animal sacrifices in the Jewish faith has no basis. There was no animal sacrifice at the time of Abraham. Also, if the bones of Jesus were able to be uncovered, it would be the greatest way to disproof Christianity. Christians could have stopped the horrible persecution they faced by producing the body. Romans could have put an end to the Christian sect that was quickly spreading. This is a far fetched comment that has absolutely no historical grounding. The photos you posted are great, and we look forward to going in about two months. Upon further research, it appears my Israel tour guide must have meant that the story of Abraham represented a call to end human sacrifices, which were performed by some pagan religions at the time. I have changed the text to reflect this. I do not mention Israelis in this section of my post. The bible does refer to people who lived in the area at that time as Israelites, though. Hmm…but in your first comment you said that the animal sacrifices continued from the time of Abraham until the destruction of the temple in AD 70. Now you’re saying there were no animal sacrifices during the time of Abraham. Are you disputing the story of Abraham, then? What is my far-fetched comment that has no historical grounding…that Jesus’ bones are buried beneath the church? I’ve always wanted to visit Israel. The religious history alone could fill up a trip, let alone all of the other history, culture and food I would want to explore. Thanks for the great info to fuel my wanderlust! 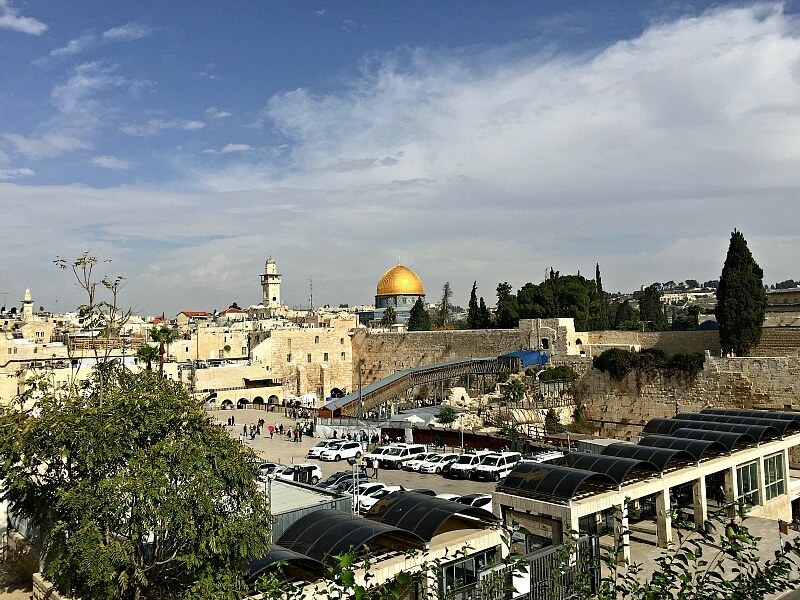 Keryn – My tip for traveling to Israel? Plan to go for AT LEAST one full week (not including travel), if not TWO! With the time it takes to travel there, it was a shame to not get to see more of the country. I definitely want to go back someday with my (Jewish) husband! Christina – Thanks you for your comment! Jordan looked so lush and beautiful behind the barbed wire in Israel. I would love to travel there someday. Hi – point #1 states “Israel is a walled city and the Western Wall is closest to Abraham’s Rock of Sacrifice” but Israel is not a city so maybe for the newbie traveler a clarification would help. Thanks for the great information. Hi Linda – That was a typo – I meant Jerusalem is a walled city, not Israel. Sorry about that and thanks for the catch! I have changed the text to reflect this.